A few days ago we took Thing 4 and Thing 5 to visit Santa at our local Wyevale Garden Centre Weybridge. We had never visited this garden centre before but it was very easy to find and the boys were very excited to be having tea with Santa. We arrived 15 minutes before our booking time and were shown straight to our table by a lovely friendly elf. Each table number was allocated to a family and there was just the right number of people there without it being too busy or overcrowded. Our food order had been taken during the booking process so they had a note of everyone's requirements before our arrival. 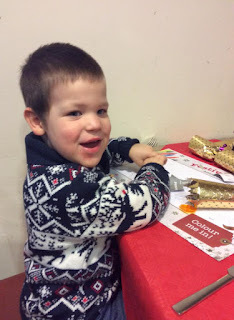 The table was well decorated and the children had a festive colouring sheet and crayons to keep them busy and we all had a cracker to pull too. For the children we had ordered chicken goujons, chips and peas. The chicken was lovely big chunks of chicken breast and there was plenty on each plate. They were served with a bowl of peas and a bowl of beans per table too which was great. 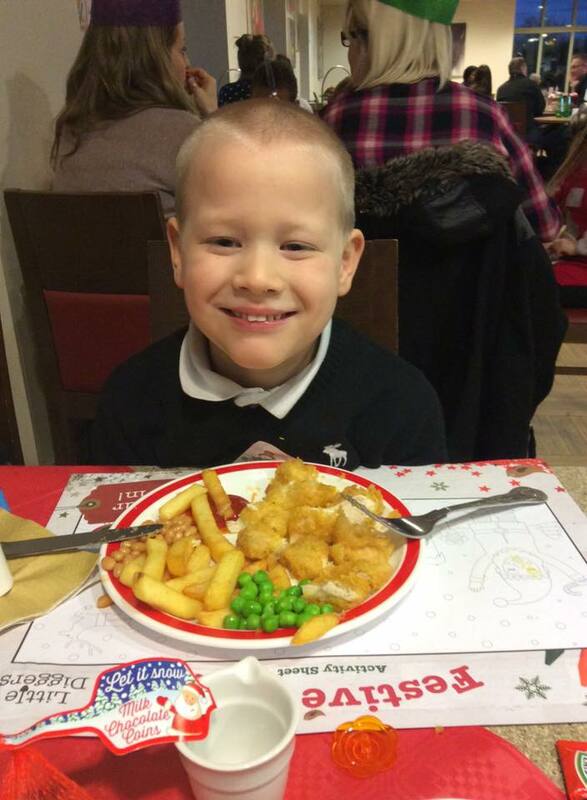 All of the children on each table were served first and then that adults got their food. The food came out in good time but we were never rushed over our meals at all and were able to take our time with everything. 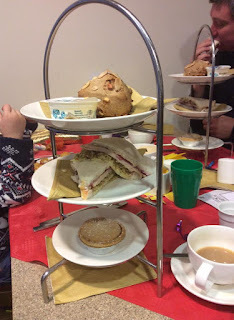 We had the festive mini afternoon tea and it was lovely. The turkey, stuffing and cranberry sandwiches were delicious, and we also had a scone with jam and clotted cream and a mince pie. 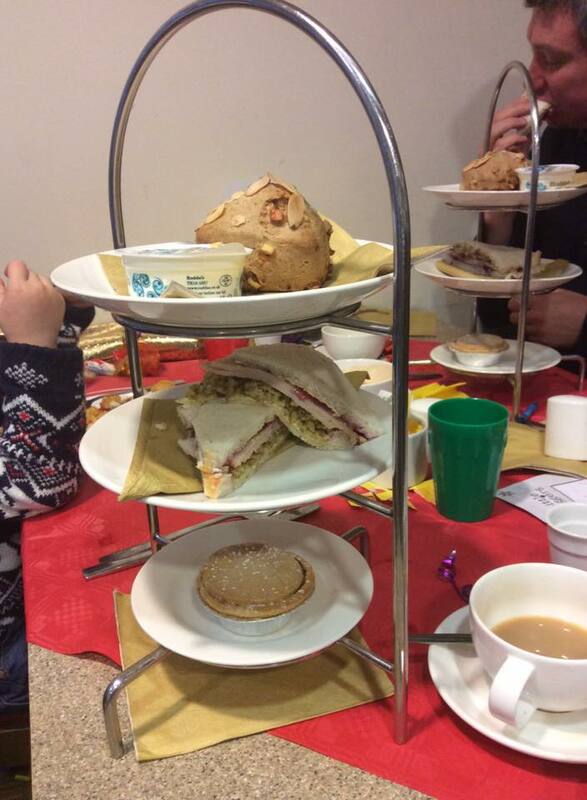 All came out on a three tier cake afternoon tea stand. 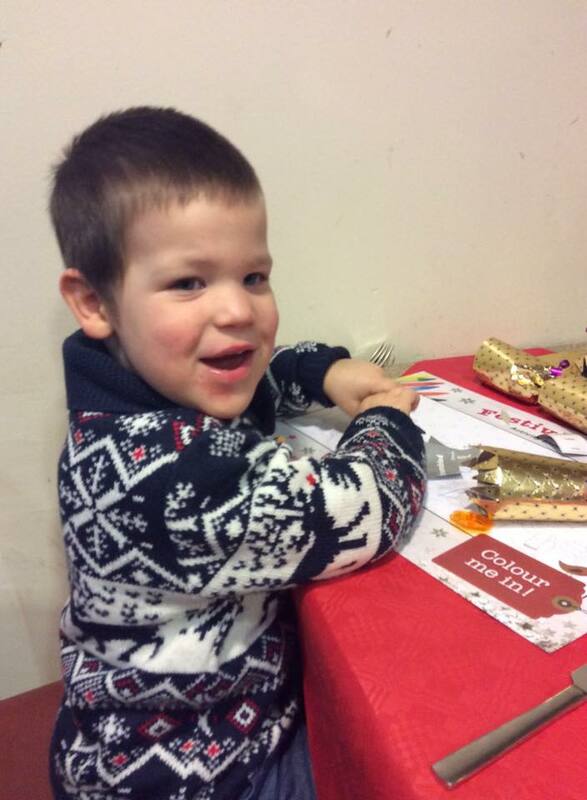 Everyone was also kept well topped up with squash for the children and hot drinks for the grown ups. The elf was very attentive to everything we needed as well as conversing with all of the children at each table whilst we all had our meals. After we had finished eating it was time for Santa's arrival. Again, the Elf really got the children involved with making sure Santa arrived. He asked them all if they knew any Christmas songs, what they wanted for Christmas and if they knew the names of Santa's reindeers. 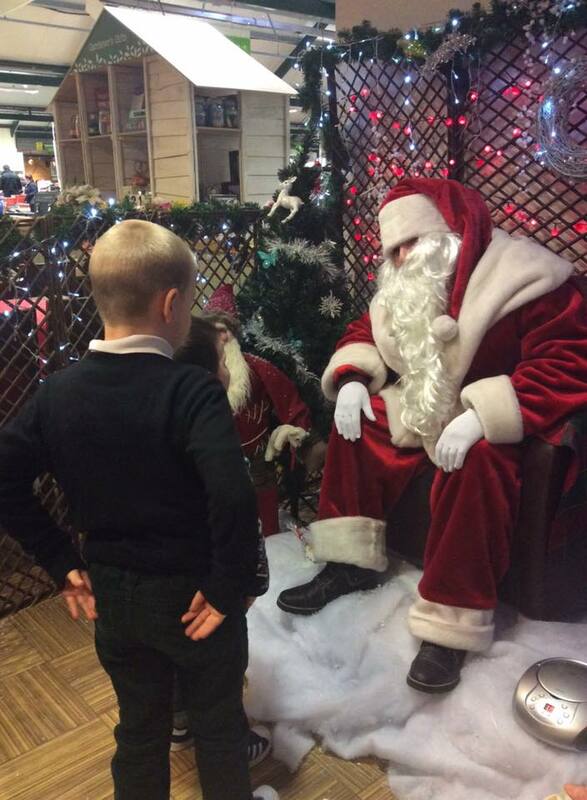 All of the children were enjoying themselves and he kept them well engaged whilst Santa made his arrival. There is nothing worse than the children getting restless whilst waiting for Santa, they are all so excited yet the elf made sure he kept them all engaged and happy. 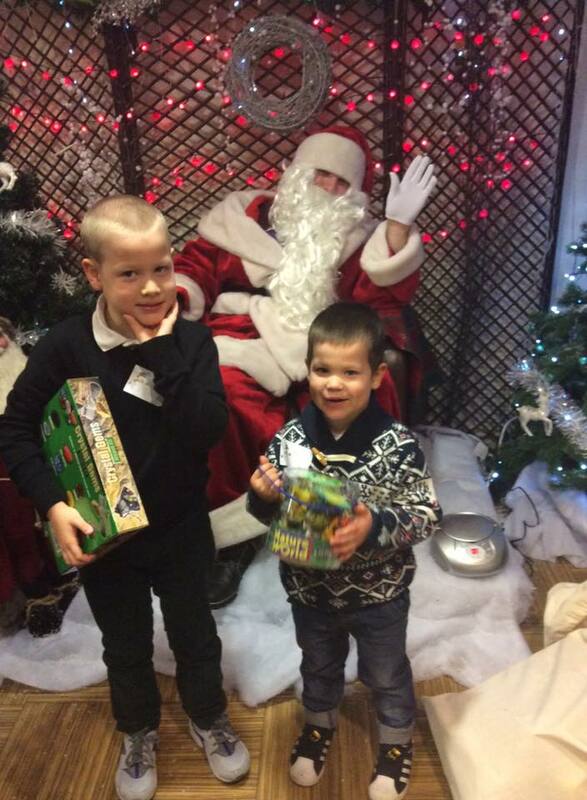 Santa arrived and the children went back to their tables and were called up with their family. Our children were last but they didn't mind as they attentively watched the other children go up and see Santa and tell him what they would like for Christmas. Once it was their turn both Thing 4 and Thing 5 made sure Santa knew what they wanted in time for the big day. A computer game for Thing 4 and some pickled onions for Thing 5, honestly he asked for pickled onions, which caught Santa by surprise for sure! Santa made sure that there would be some elf made pickled onions ready for Christmas!! 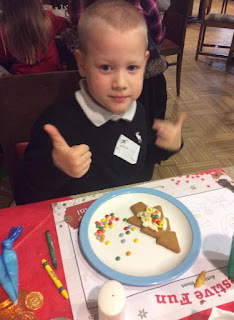 Whilst the children were waiting to see Santa they were also given a Christmas tree shaped gingerbread biscuit to decorate which they really enjoyed doing. With chocolate buttons and beans to add on to the tree using buttercream provided they had a great time decorating them and Mummy enjoyed helping too! 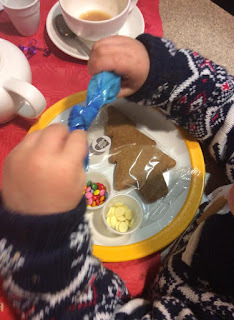 They had made a mini piping bag with the buttercream on and each child had their own individual plate with everything they needed. Overall this was a really lovely festive experience. The food was delicious and it was nice to sit with other families and enjoy some festive food before Santa arrived. The Elf (and other staff) were all very attentive and helpful and kept us well stocked with drinks and made sure everything was ok for us. 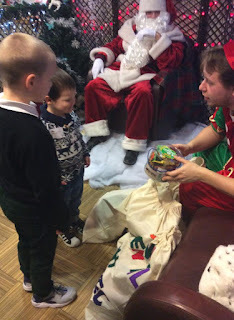 The Santa visit wasn't rushed and they had a lovely chat with the main man. The gifts they received were fab. Thing 4 chose a lovely hidden gems mining kit which he got stuck into as soon as he got home. Thing 5 chose a tub of dinosaurs with a play mat which was a great gift and will be played with for a long time to come. 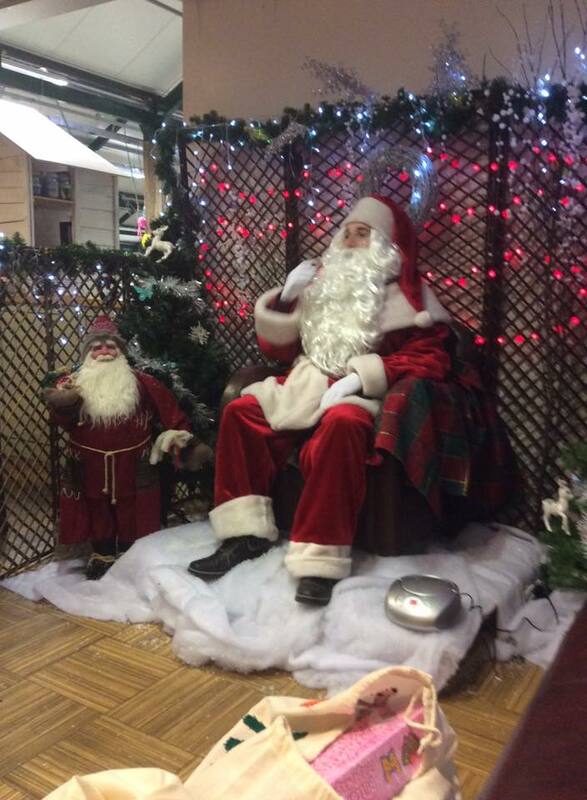 If you are looking to visit Santa I would highly recommend tea with Santa at Wyevale garden Centres, just go to their website and look up your nearest one and bookings can be made online. At £9.99 for the children and £7.99 for the adults it is definitely well worth the money and was a lovely relaxing evening, the whole experience lasting around 1.5-2 hours in total. Disclaimer; We were gifted tickets to see Santa for the purpose of this review, all thoughts and opinions are our own.